As told to Photographers Without Borders by Anita Bonnarens. To travel across Cambodia is to travel within. I returned home transformed in a profound way. 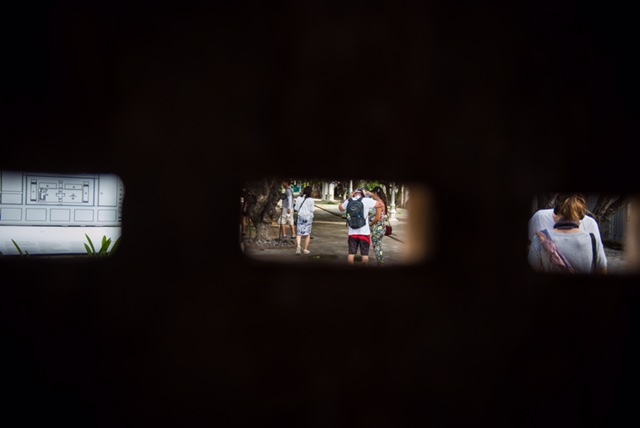 Visiting the Tuol Sleng Genocide Museum in Phnom Penh offers you a glimpse through a keyhole into the dark interior of the Khmer Rouge, who were responsible for the deaths of as many as one-fourth of Cambodia's population from 1975-1979. Tuol Svay Pray High School sits on a dusty road on the outskirts of Phnom Penh, Cambodia. In 1976, the Khmer Rouge renamed the high school S-21 and turned it into a torture, interrogation and execution centre. 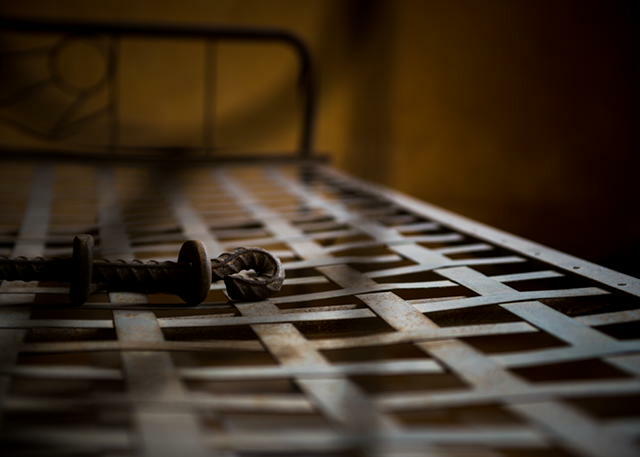 ONE OF THE SPARTAN INTERROGATION ROOMS WITHIN POL POT'S SECRET PRISON. Our tour guide lost several family members during the genocide. In a calm, deep and thoughtful voice, he shared with us the memories of a horrible past. The stories that took place between these walls impacted all of us and him, all over again. The horrible facts and numbers reflected in his bright eyes, while his body language gave away the incomprehensibility all of us present were experiencing. MR. OM CHAMBROEUN ON HIS JOB: "SOME DAYS IT'S OKAY; OTHERS, IT'S NOT." Each of the almost 6,000 S-21 portraits that have been captured illustrates a story of shock, resignation, confusion, defiance and horror. Putting the present day in context with history, your travel outside becomes a travel inside; a journey of reflection and soul-searching. One's sense of gratitude and appreciation for life falls apart and takes on new dimensions. A GLIMPSE INSIDE AND OUTSIDE THE PRISON'S WALLS, REPRESENTING PAST AND PRESENT; HOPE AND GRIEF. Of the 14,000 people known to have entered, only seven survived. One of them is Bou Meng. 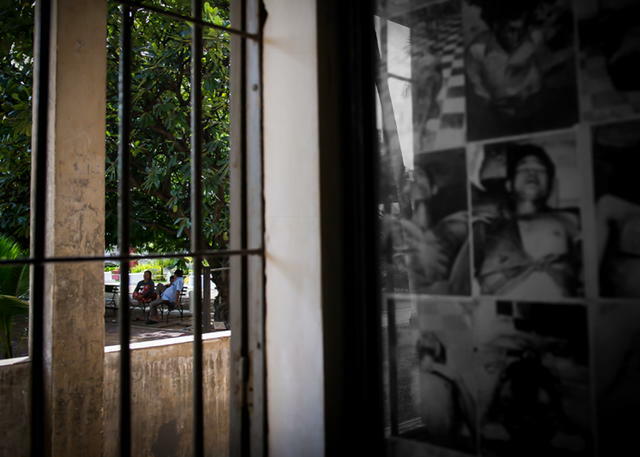 Forty years after the Pol Pot took control of the country, he still returns to the cells every day to remind people of the atrocities that once took place there. Meeting Bou Meng was akin to meeting the souls of all Cambodians. He was one of the friendliest and optimistic people I have met. Cambodia is a wonderful and beautiful country filled with inspiring people. I hope you find yourself there some time. BOU MENG, A SURVIVOR FROM THE KHMER ROUGE PRISON, S-21. And if you do, consider reaching out a helping hand. Everybody in Cambodia has been affected by the Khmer Rouge. Education, religion, economy and healthcare all stopped as teachers, doctors, monks, merchants and the elite were first targeted in the genocide. After the Khmer Rouge fell, Cambodians focused on growing and finding food and on looking for members of their families. Post-traumatic stress syndrome was rampant, but luxuries like diagnosis and treatment did not exist. Children born after the Khmer Rouge have not escaped — they were raised by traumatized family members. The cycle of poverty and abuse continues today. The majority of Cambodians live in poverty and 40% of children are malnourished. The average income is less than $3 US per day, and many people live on much less. Small amounts of money go a long way to changing peoples’ lives. For a full list of NGO's that support volunteering in Cambodia, please click here.